for the battle were not ready. First, you must read the definitive post about Rick Rescorla by Greyhawk at the Mudville Gazette. Rescorla was one of my heroes when I was a Sergeant-turned-Cadet and began reading extensively about Viet Nam and the Ia Drang Valley. 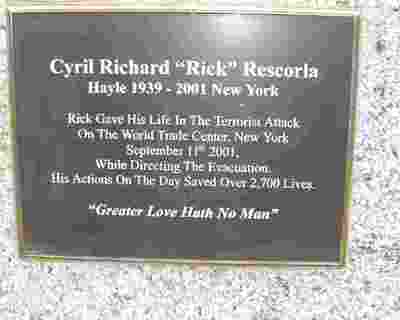 Rick was a British (Cypress and Rhodesia) and American (Viet Nam) war hero. He retired as a Colonel in 1990. Tenacious, strong, and leading all the way to the end. 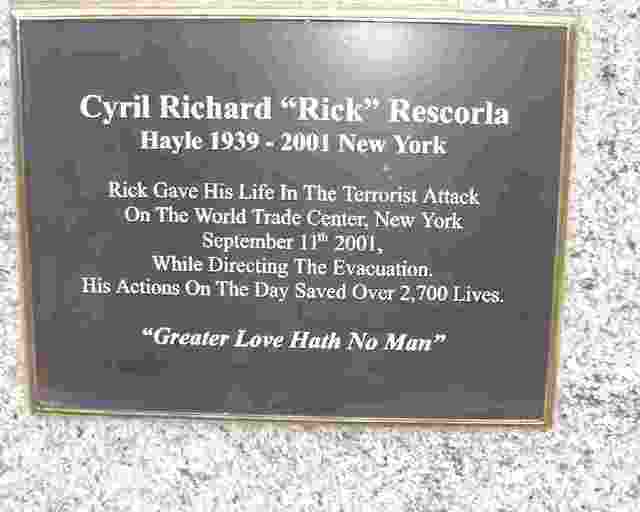 In 2006, we honored Rick at Pundit Review Radio where I featured him - Rick Rescorla - Someone You Should Know Radio ("September 11th" podcast for Pundit Review Radio). Appropriately, Rick now has a statue at the Infantry Center at Fort Benning. The US Army has honored his accomplishments. AWTM had a post about visiting the museum and defending Rick. Thank you for keeping Rick alive. I know why Rick died, and I am so proud of him. The book, and of course the fabulous bronze statue, which will be on Heroes'Walk in 2008 will endure forever, as his legacy, as a new Hero in our new millinium. Today is a day to be proud to be an American. A PETITION TO PRESIDENT GEORGE W. BUSH TO AWARD THE PRESIDENTIAL MEDAL OF FREEDOM TO C.R.”RICK” RESCORLA FOR HEROISM AND GALLANTRY BEYOND THE CALL OF DUTY ON SEPTEMBER 11,2001. MR. RESCORLA CAME TO THIS COUNTRY AS AN IMMIGRANT TO BECOME AN OFFICER IN THE ARMY. MR RESCORLA SERVED WITH SUCH DISTINCTION AS AN OFFICER IN VIET NAM THAT ALL WHO SERVED WITH HIM CONSIDER HIM THE BRAVEST MAN WE HAVE EVER KNOWN. HE WAS HIGHLY DECORATED FOR HIS BRAVERY AND LEADERSHIP IN COMBAT. HE BECAME A US CITIZEN AND SOUGHT A HIGHER EDUCATION OBTAINING A BACHELOR AND MASTERS DEGREE AT UNIVERSITY OF OKLAHOMA AND FURTHER OBTAINING A LAW DEGREE BEFORE SERVING A AS TEACHER AT USC LAW SCHOOL BEFORE BEING LURED TO THE WORLD OF COMMERCIAL BANKING. MR. RESCORLA’S SPECIALTY WAS SECURITY AND SECURITY LAW. IN 1993 HE WAS THE LAST MAN OUT OF THE TRADE TOWERS AFTER EVACUATING EVERYONE. ON SEPT.11TH IN SPITE OF BEING TOLD HIS BUILDING WAS NOT IN DANGER, HE IMPLEMENTED THE EVACUATION PLAN HE HAD DEVELOPED FOR HIS FIRM, MORGAN STANLEY. AS A DIRECT RESULT OF HIS EFFORTS THAT DAY AND HIS QUICK ACTION, OVER 2600 EMPLOYEES WERE SAVED. MR RESCORLA WAS LAST SEEN GOING UP TO RESCUE PEOPLE WHO WERE UNABLE TO GET DOWN. HIS ACTIONS REFLECT THE VERY BEST ABOUT AMERICA, ITS CITIZENS AND ITS DREAMS. THE UNDERSIGNED URGE YOU TO RECOGNIZE MR RESCORLA BY BESTOWING THIS HIGHEST HONOR TO THIS MOST DESERVING MAN. Why hasn't the President awarded the medal to Rick? The Presidential Medal of Freedom is awarded for "an especially meritorious contribution to the security or national interests of the United States, world peace, cultural or other significant public or private endeavors."